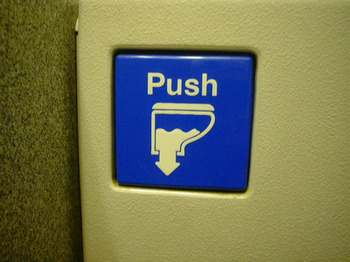 A long time ago I began collecting pictures of the graphics in aircraft toilets. Because a) it's something to do on a boring flight and b) I thought I'd be able to make a clever point about differentiation or something and c) I'm a bit strange. There's a bunch of them here but the strange thing is how undifferentiated they are. Here you've got airlines desperately trying to prove they're a little bit different from everyone else and here's a prime opportunity to do it and they're completely wasting it. Now, maybe I'm not flying classy enough airlines, maybe Virgin or someone's doing it better, but most of these are transcontinental business class flights on decent airlines. And they all look like the airline just stuck with the decals that Boeing or Airbus supply. And rebranded the bottle of handsoap. I think they ought to be able to do better than that. That being said I do quite like the graphic style they all use. And the icons. Apparently today is the last day we'll see such a thing.